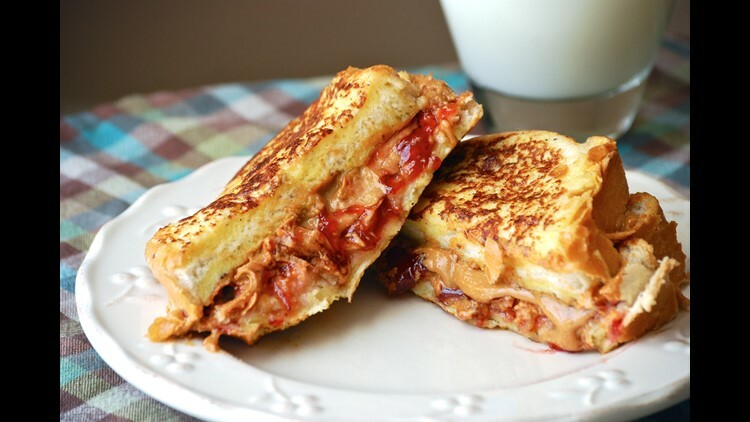 Everyone loves a good PB & J sandwich - but how do you take something so classic and make it even better? ADD FRENCH TOAST. Thanks to Macaroni & Cheesecake for the recipe!! Place a skillet over medium heat and spray with cooking spray. In a shallow bowl, whisk together the egg, milk, cinnamon & brown sugar. Lightly dredge each piece of bread through the egg mixture. Don’t coat too much or you won’t have enough egg. Place bread in the skillet and cook for two minutes. Turn bread and cook for two minutes more and then turn again and cook for two minutes. * (You are cooking one side of each piece of bread fully and leaving the other side just slightly undercooked). If doing peanut butter & jelly sandwich, remove bread from skillet and transfer to plate. On the side of the bread that is fully cooked (the side that was cooked twice on one side), spread peanut butter, then spread jelly on the other piece of bread on the fully cooked side. Sandwich together and return to skillet. Reduce heat to medium low and cook sandwich on each side for approximately one minute until golden brown. Remove from skillet, cut sandwich in half and serve. Top with powdered sugar and dip into syrup if desired.